Shop online for over 200 hobby and craft wood at discounts up to 42%. Basswood is the most popular of the 7 hobby and craft wood categories, then Balsa, and Plywood. Midwest is ranked #1 out of 4 hobby and craft wood manufacturers, followed by Walnut Hollow, and Guillows. This is a Package of 55 Strips of 1/32" x 1/8" x 24" Basswood from Midwest Products Co. This is a Package of 20 Micro-Cut Balsa Strips (1/8"x 3/8"x 36") by Midwest Products Company. 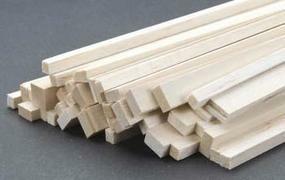 This is a Package of 20 Pieces of 1/4" x 1/4" x 24" Basswood from Midwest Products Co. This is a Package of 60 Micro-Cut Balsa Strips (1/16"x 1/16"x 36") by Midwest Products Company.